Don’t you just love the name of this dish? 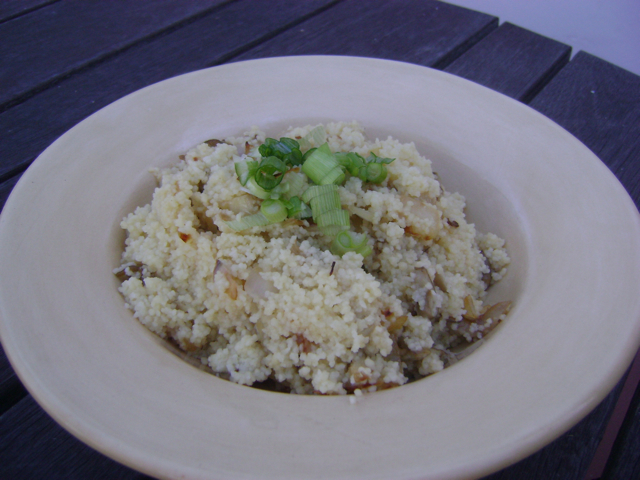 Hearty and filling, this lovely take on couscous from Back to the Roots showcases the pearl oyster mushroom beautifully! In a medium saucepan, heat the olive oil over medium heat, then add the onions. Saute the onions, turning frequently, until translucent (about 3 or 4 minutes). Add the mushrooms, continuing to turn them frequently, to cook for another 4 minutes. In a separate pot, heat the chicken stock until boiling. Add the couscous, stir, cover, and remove from heat. Let the couscous stand for 5 minutes, then take off the lid and fluff the couscous. Toss in the onions and mushrooms. Top with green onion pieces and serve. Serves 4.